There are many social networks catered towards the athletic community, such as eFans, Weplay, Sportsmates and others. And fan-based social networks like SuperFan and TopFans also let users pay homage to professional athletes. 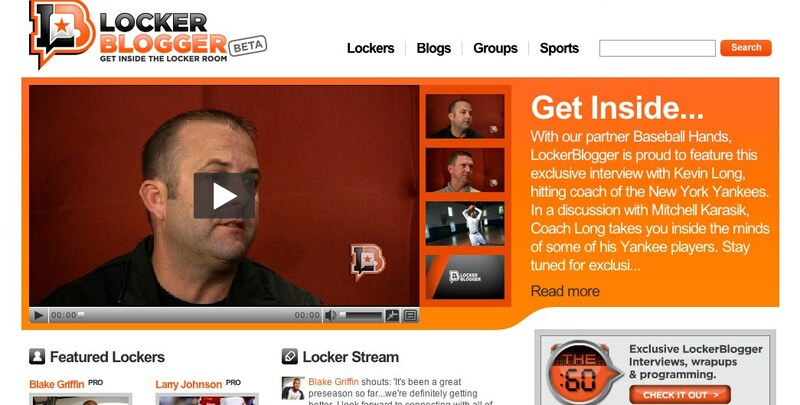 LockerBlogger is entering the already crowded space as a sports-centric community that connects athletes, coaches, and fans. The social network’s hook is to get pro and famous athletes to create profiles where they can blog, post video content and give fans an inside look into their lives and training. In turn, fans can connect with professional athletes in a more engaging way. Professional athletes can create “Pro” profiles and blog, post a voice messages, put up photos and videos. Athletes can aslo link their accounts to their Twitter stream, and access the streams (and Tweet) from LockerBlogger. And the profile is a marketing tool that athletes can use towards branding. Coaches can feature “How-To Video Clinics ,” which are videos about various skills in the fields that they have expertise in. Coaches can also post schedules, put up pictures and videos of previous games, and send out messages. LockerBlogger already features more than 140 pro athletes, including Don Mattingly (MLB), Lawrence Taylor (NFL), Larry Johnson (NFL), Sam Casell (NBA), Jason Kidd (NBA), and Chad Morgenthaler (pro fisher). Whie LockerBlogger has a sleek interface and innovative multimedia features for professional athletes to use, the obstacle the network will face (besides competition) is being able to drive traffic to its site. But LockerBlogger says it will soon implement Facebook Connect and launch a Facebook App.